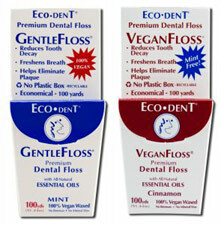 Eco-Dent Floss is vegan once again! Infused with essential oils that can help reduce tooth decay and freshen breath, you get a lot of floss in each small package (a huge 100 yards total length, about twice as much as most brands of floss!) It's also made with paper packaging that can be recycled, leaving no waste behind when you are done with your floss roll. Available in Cinnamon or Mint. $4.49 per package. From Marsha Aronson of Walden, New York on 3/7/2016 . From Tracye of Havertown, Pennsylvania on 1/28/2010 . Most dental floss works about the same, but what I love about this one is that it comes in a paper rather than plastic container. So often, otherwise eco-friendly, natural products are stuffed into plastic containers just because it is convenient to do so. (I am not saying that all vegans have to be eco-friendly, but I like to be both.) Kudos to Eco-Dent for choosing paper! Finally, EcoDent makes a VEGAN floss! From Anonymous of Charlotte, North Carolina on 7/6/2009 . EcoDent finally got a clue and made some 100% vegan floss. This stuff doesn't smell strongly at all and works just like normal waxed floss. It's average size floss -- not super thin but not thick (read: painful to get between your teeth) either. It lasts a few months for me, and I floss every day. The floss bobbin comes in a small, thin, sealed plastic pouch (very minimal plastic use), and you have to open the floss and get it started yourself. Also, the paperboard package can be recycled (as well as the removable metal "floss cutter" thingy), which is great. The paperboard package has its drawbacks, though: it can get beaten up after a while, especially if you're traveling; or it can get soggy if it gets wet. No complaints overall, just glad EcoDent finally listened to actual practicing vegans this time and took out the lactoperoxidase that they use in their other, non-vegan floss! From Siri Vienola of Pullman, Washington on 6/3/2009 . This floss tastes great and works well. It is a little on the thin side, but that is great for getting into tight spaces. I've been using this floss daily for well over a month and still have a lot left, so it is economical in spite of the price. In addition, I love that it comes in a mostly recyclable package (box is recyclable, with metal floss cutter and plastic bag around floss being the only non-recyclable parts). Great!